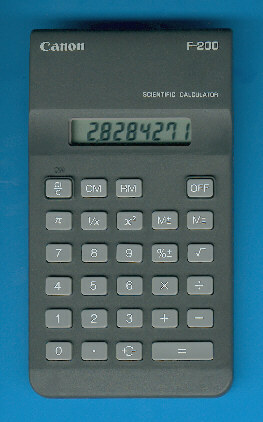 Size: 4.9" x 2.7" x 0.8"
The Canon F-200 was introduced in 1990 as a Scientifical calculator. To be honest, we would judge it as a Basic calculator. We know similiar functionality from the early Texas Instruments TI-18 and its sibbling TI-1744. Dismantling the F-200 gives a common design of a OEM calculator assembled in China. Unfortunately the single-chip calculator circuit is soldered the wrong way, we can't decipher the designation. Don't miss the more sophisticated F-300 introduced in the same year. © Joerg Woerner, March 5, 2006. No reprints without written permission.